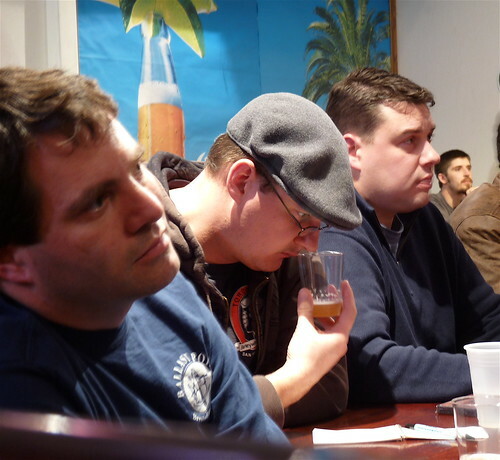 June, 2009: Way back in the depths of winter, during Beer Week, we helped put on an evening of beer evaluation with one of California’s top-tier BJCP judges, David Teckam. It was incredibly popular and worth repeating. This is planned to become a regular annual SF BEER WEEK tradition — look for the listings or drop us a note! We’re delighted to be doing the eminars again this Tuesday, June 16th 2009. This time the seminars were set up for the week leading into the National Homebrewing Convention, so that some of the excellent homebrewers who are coming to town can participate. It’s fun to learn with someone who is highly experienced. We also enjoy meeting other people who like to learn about beer. Most likely we (Gail and Steve) will be helping or leading other such presentations at some point after this one. If you might be interested in one of these classes, or in other tasting events sometime in the future, email us any time. (beerbybart (at) yahoo (dot) com) We’ll get in touch with you when we do a beer education event. Explore Beer By BART; see our list of the San Francisco Bay Area’s best beer places with detailed transit info, so you can get out there to enjoy without driving.